Oh, you think you sweat too much? Have you met me? So, if you think that sweat doesn’t literally pour off of me in a hot yoga class, you’re wildly mistaken. But, here’s the thing about sweating in hot yoga: You’re supposed to sweat. Everybody is sweating. I mean, sure, some glow a little more than others, but there’s not a soul in class who’s not drippin’ by the time we hit savasana. So the fact that I’m sweating buckets? Yeah, not a big deal at all. And as someone who’s been a little self-conscious about her rampant sweatiness in the past, that is awesome. But, with excessive sweat comes a few challenges, and I’ve come up with a few tips (and been sent and reviewed several products) over the last few months that make hitting that hot yoga class on the reg a little easier — even for a massive sweaty sweater who sweats like me. If you know you’re gonna sweat, you probably know it’s a good idea to drink some water — maybe even some coconut water, or a sports drink. But let’s go a step farther and plan ahead, because chugging a bunch of water right before class will not only give you an uncomfortably full bladder, but won’t be as effective at helping your body sweat out all the bad stuff. Sip away all day (or the day before if you’re going in the morning), and be sure to bring some water with you to class. I don’t usually drink much during class, actually — surprising considering how much I can put away during a sweaty HIIT session — but when I need it, I’m always glad it’s there. And I’m extra glad if I’ve thought ahead and used lots of ice cubes, because otherwise it’s very warm by the end. If you’ve done other yoga classes, you probably know whether you like a thin or thick mat. As someone with some knee issues, I find a thicker yoga mat to be far more comfortable for any poses where my knees are on the ground. But when you’re in a hot yoga class, the texture of the mat becomes extra important, because all that sweat can make it things really slippery. I received a Yellow Willow yoga mat to review, and it’s been a gamechanger. These mats have towel-like absorbency, impressive grippiness, and are hand or machine-washable — however, you can clean it between practices with a gentle spray cleaner to keep it fresh for several uses. Plus, the top layer is made from recycled plastic bottles, which is bonded to natural, biodegradable tree rubber, so the whole thing is eco-friendly (and fully biodegradable, should it reach the point of retirement). Oh, and it’s really pretty. That might not necessarily help my practice, but it sure doesn’t hurt! 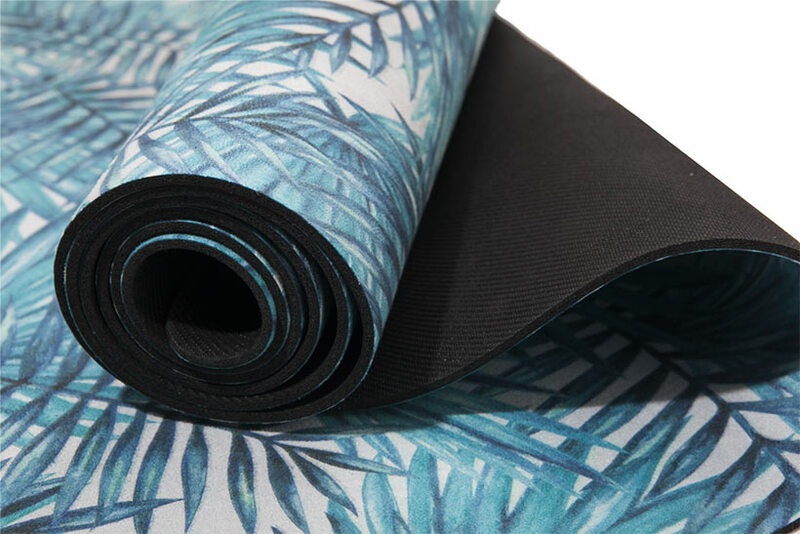 If you’re using a regular yoga mat (not one like the Yellow Willow mats that are designed to absorb your sweat), you’re going to want a towel over your mat to keep sweat from pooling. You can get away with a bath or beach towel, but the ones designed for hot yoga work a lot better, in my experience, because they just sop it all right up. LEUS sent over one of their yoga mat towels, and it’s another thing that I don’t know how I lived without. It’s suede microfiber with anti-microbial coating, which sounds really fancy but what’s important to know is that it feels soft, provides good grip, and doesn’t stretch or slide more as it gets wet. The fact that they’re offered in some gorgeous designs (below is my fave) is a nice bonus. You’ll probably also want a towel to mop yourself during and/or after class — I can get away with a regular gym towel for this on most days (probably because I don’t care if I walk out sweaty), but plenty of people show up with a second full-size towel. I love all the draping, flowy tops people are wearing for yoga right now — but I can’t begin to wear anything like that in hot yoga, because a few minutes in, that loose, gauzy top is soaked with sweat, weighs two pounds, and is stuck to my face. So, in my experience, I’m better off wearing something lightweight and form-fitting (the tops I mention in this post are perfect because of the attached bra top, although I’ve also joined many of my classmates in just stripping down to a sports bra on its own. Progress!). Now, I’ve read a lot of tips suggesting short, fitted shorts rather than pants or capris, and while I’d love to wear as little as possible, I find this isn’t a great option for me because, without any material there, my legs are too slippery for me to hold any poses that require pressure and contact with them (like crow, tree, etc.). Some people seem to make it work, though, so feel free to give it a shot! Just maybe make sure to skip the leg lotion that day. But even if you know what’s coming, try to get there 10 to 15 minutes early so that your body (and your mind, for that matter) can acclimate to the heat, especially if it’s cool outside. If you can take a few minutes to sit, breathe, and move in ways that feel good before your class starts, you’ll get so much more out of each pose. Plus, you never know — you might end up make a new friend or two. Great & Unique Article. Thanks for Sharing Great information. Keep Up the Good Work. Hey, thanks for sharing these yoga tips for a happy, healthy and Active Lifestyle. Keep up the good work. Disappointed with the quality and size of the towels. Not big enough for gym use. They came shrink wrapped so I could not give them as a Christmas gift. Would not recommend them. Will have to use them a dusting clothes.